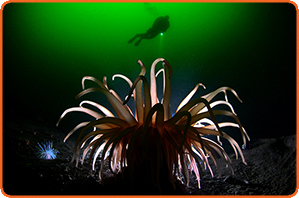 The story: The "Deeplet sea anemone"/North sea anemone (Bolocera tuediae) can be found in the cold, green waters of the Oslo fjord in Norway, at depths from 25 meters and below – like an oasis in the mud. A certain species of red shrimps (Spirontocarus liljeborgi) can be found seeking shelter under this type of large cold water anemone. 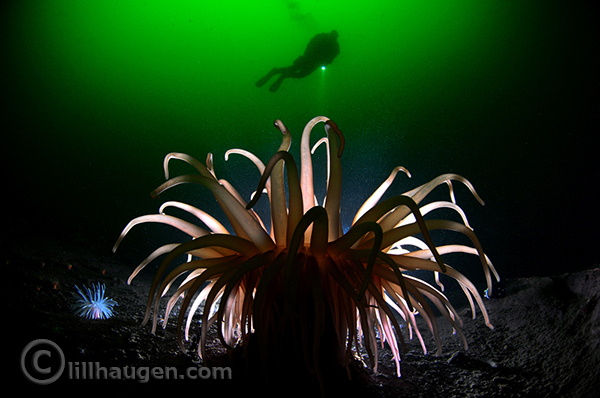 This anemone is backlit, by placing the strobe behind the anemone and using a remote slave sensor trigger to fire the strobe. Equipment Used: Nikon D300, Nikon Fisheye 10.5mm lens, one Ikelite DS160 strobe, and a Triggerfish remote slave sensor connected to an INON Z240 strobe. The price is a 7-night liveaboard cruise on the S/Y Fiji Siren!